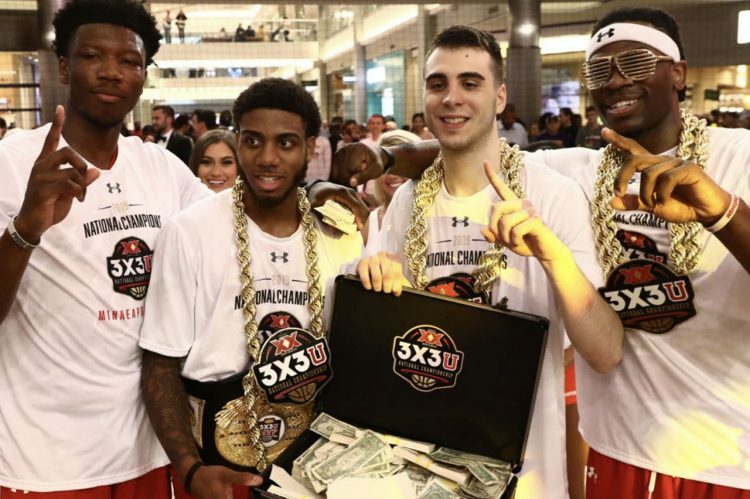 College of Charleston men’s basketball player Jarrell Brantley and Team Colonial Athletic Association (CAA) took home $100,000 Sunday, April 7, 2019, after winning the 2019 Dos Equis 3X3U National Championship tournament in Minneapolis, Minnesota. Brantley, a senior forward for CofC, played in the three-on-three basketball tournament with fellow Colonial Athletic Association players Vasa Pusica of Northeastern, Devontae Cacok of UNCW and Hofstra’s Justin Wright-Foreman. The CAA quartet competed against all-star teams of seniors representing all 32 Division I conferences. Team CAA went 3-0 in Pool G play to advance to the knockout round. They posted a perfect 7-0 record and outscored their opponents by 43 points in that stretch. In front of approximately 2,000 fans surrounding the four levels of the Mall of America Rotunda and an ESPN2 national audience, Team Colonial used a balanced perimeter and inside game to overwhelm its opponents throughout the tournament. They defeated Team West Coast Conference (WCC) to clinch the title and prize money. Brantley had eight points against the WCC and his two late free throws clinched the tournament title for the CAA. Including $1,000 for each of their three pool play wins, Wright-Foreman, Brantley, Cacok and Pusica will share $103,000. They have also earned the right to compete in the 2019 USA Basketball 3×3 Open National Championship in Las Vegas next month. For the full recap of Brantley’s performance with Team CAA visit cofcsports.com.